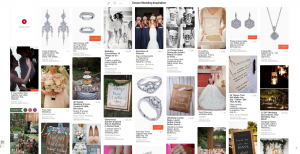 Our first engagement ring shopping tip is to check her pinterest! As a 20 something year old woman with a pinterest page it is without a doubt impossible not to go on pinterest and pin items for the future! When “stalking” your girlfriends pinterest page look for boards that are titled “Future” or “Dream Wedding.” or simply click on the pins button to browse all the items she has pinned to her account. We know, we know, we know… sometimes we don’t always know exactly what we want but I promise there is always a method to our madness! Let one of our diamond consultants help you decipher what she really likes out of all the rings she pins to her board. There may be a style trend that you don’t see within all the rings that she has pinned that we pick up on. Whether the rings are all princess cuts or maybe they all have a halo there is most likely similarities to the rings . No matter what, it will definitely help you move in the right direction.